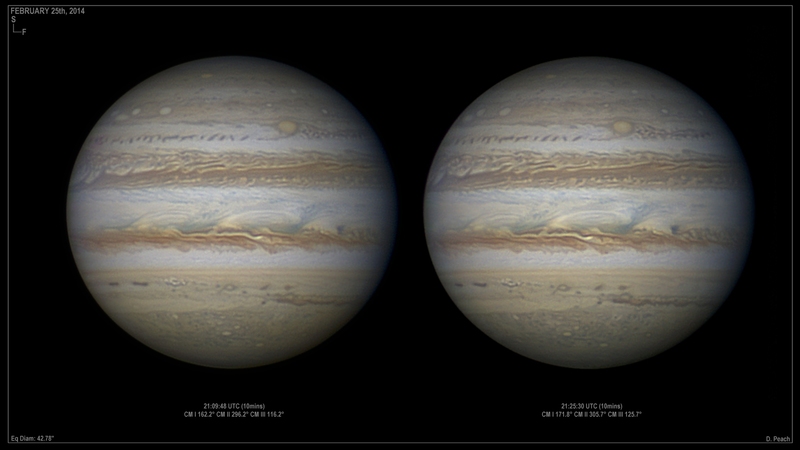 We told you this was going to be a good season to observe Jupiter, and astrophotographers in the northern hemisphere have been making the most of this time of opposition where Jupiter has been riding high in the sky. What we didn’t know was that there was going to be a familiar face staring back at us. A combination of three storms has been noted throughout this Jupiter observing season for its resemblance to Mickey Mouse’s face (at least in outline), and astrophotographer Damian Peach has captured some great images of these storms, along with the iconic Great Red Spot, its little brother Oval BA and other turbulence. Damian has also put together a stunning movie (below) showing about three hours of rotation of the king of the planets. Damian explained the Mickey Mouse storms are two anticyclones (high pressure regions) that form the ears while a longer elongated cyclone (low pressure) forms the face. The abundance of storms on Jupiter are a result of the planet’s dense atmosphere of hydrogen and helium and large gravitational field. Storms on this planet are likely the strongest in the Solar System. Jupiter reached its most northern point for 2014 at a declination of +23.3 degrees on March 11, but it’s still easily visible since it is the brightest starlike object in the evening sky. Jupiter’s Great Red Spot and the ‘Mickey Mouse’ storms on February 25, 2014. Credit and copyright: Damian Peach. 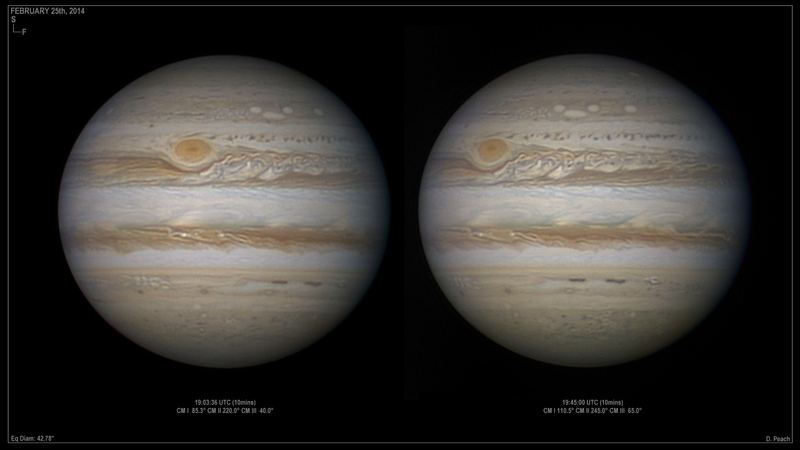 More images of Jupiter on February 25, 2014, with these showing the Oval BA storm, with the Mickey Mouse storms peeking around the left side. Credit and copyright: Damian Peach. As David Dickinson mentioned in his article on observing Jupiter, we’re also in the midst of a plane crossing, as the orbits of the Jovian moons appear edge-on to our line of sight throughout 2014 and into early 2015. Check out more of Damian Peach’s work at his website.